Qbee’s Quest: Start making birthday cards for all my friends with March birthdays. March is the month of birthdays or the month that I make the most birthday cards. In fact, I’ve joked that I will not make any new friends who have a March birthday. 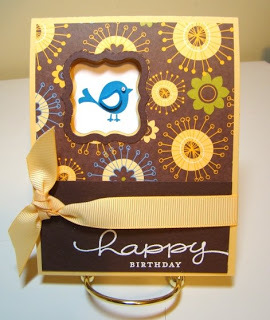 Yesterday, I made a birthday card using the adorable cheep talk set, the cheery good morning sunshine paper and the Movers & Shapers Curly Label Die. To make the card base, run a piece of 8-1/2″ x 4-1/4″ So Saffron Card Stock through the Big Shot (do not move the curly label piece). To make the designer paper layer start with a piece of 5-1/2″ x 4-1/4″ Good Morning Sunshine Paper and align it along the steel rule edges of the die and then crank it through the Big Shot. To make a frame for the window, balance a small piece of chocolate chip card stock on the curly label piece, run it through the big shot and then carefully cut out the frame along the perforations.